Purpose: The effects of lumbosacral and spinal orthoses on low back pain and gait are not exactly clear. We previously developed a trunk orthosis with joints providing resistive force on low back load to decrease such load, and confirmed its positive effects during level walking in healthy young adults. Therefore, we aimed to determine the efficacy of this trunk orthosis during level walking in healthy elderly subjects. Methods: Fifteen community-dwelling elderly subjects performed level walking at a self-selected speed without an orthosis, with our orthosis, and with a lumbosacral orthosis. Kinematic and kinetic data were recorded using a three-dimensional motion analysis system, and erector spinae activity was recorded by electromyography. 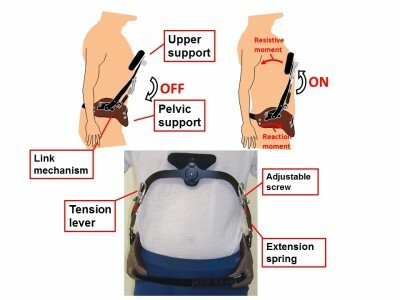 Results: When comparing the three conditions, our orthosis showed the following effects: it decreased the peak extension moment, increased the peak flexion moment, decreased the lateral bending angle, increased the peak thoracic extension angle, and had significantly lower erector spinae activity and significantly larger peak pelvic forward tilt angles. Conclusion: Our orthosis with joints providing resistive force decreased low back load and modified trunk and pelvis alignments during level walking in healthy elderly people.